Enrique Ralph was born in Mexico City in 1973. He is a graduate of the Architecture faculty at the Universidad Autónoma de México in 1998. 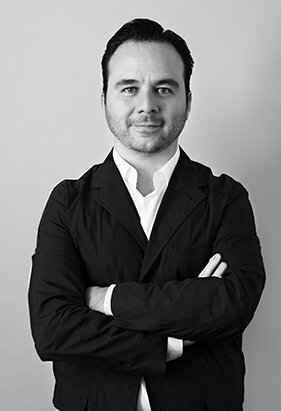 Enrique joined Grupo Sordo Madaleno in 2011 as Head of Interior Design. His rigorous eye for detail and passion for his work led him to take up the position of Director of Interior Design, which he currently occupies. His work and experience encompass both architecture and interior design projects across a wide range of typologies and scales, in the residential, commercial, sports, corporate and hotel sectors. Rather than seeking to generate a single style, his projects produce a unique and personalized response to each project. Enrique is a designer with over 20 years’ experience and an awareness of the responsibility of the architect in today’s society. He incorporates into his daily professional practice the thought, coordination, structure, and research required to bring the projects under his responsibility to fruition. His mission is to create responsive spaces, which together with the artistic passion and enthusiasm he displays every day, has left a significant mark on the development of the interior design department at SMA. Enrique has been involved in a great many projects, including most notably Peyote Dubai, Nueve Nueve Mexican Bistró, Nobu Polanco, Restaurante Sylvestre, Hotel Solaz in Los Cabos, Isla Pasión in Cozumel, and Grand Hyatt Playa del Carmen Hotel. He is currently working on the design of a number of hotels, including C5i Hidalgo – Seguritech, Moliere 101 and Arquimedes 165. Previously, he worked as a freelance project manager for residential works. He has also worked as Architectural Coordinator for Nacif Serio Arquitectos Constructores y Grupo Ingeniería, Arquitectura y Asociados, in the architecture department.